front row, tv monitor, informed friends to discuss what we’re watching…. 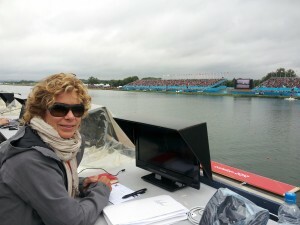 I went to London with CTV to be a Primetime studio analyst for the Olympic rowing regatta. This meant that while a team of people would call the races stroke by stroke as they happened, I would observe the regatta and explain what was going on in the big picture to the Primetime audience in Canada in the middle of the night in the UK. To do this – I had one hell of a daily schedule. I was at the Eton Dorney Rowing Centre from 8am-3pm to get a feel of what was happening at the regatta, talk to my international peers and watch all the incredible races. My actual work with CTV was in the evening. I would go into the International Broadcast Centre (IBC) at about 7pm to prepare for the live Primetime show with Brian Williams. Depending on what time I was on – I was there until 2-3am. I was very lucky to have a driver for most of my commuting. I had a hotel about 45min from the IBC – where I would sleep for 1-2 hrs by day- and another hotel about 30min from the Rowing course- where I would sleep 2-4 hrs by night. The drive between the two was never less than an hour, sometimes closer to 2hours, and once – when I had to take a bus and a train – it took me 3hours 20 minutes. The route between the two was actually incredibly scenic and I was driven by the London Eye, Houses of Parliament, Big Ben, and Buckingham Palace. One day- we went passed Big Ben as it chimed 3am… and then again later as it chimed 3pm –for nine days I was commuting a lot and sleeping only a little. 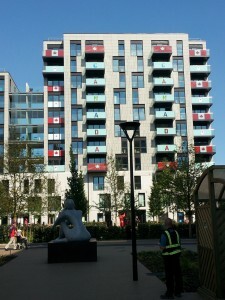 My second day in London and being at the Olympics is certainly living up to memory. It’s always bigger and brighter around them. These are my 8th Olympic Games and each time I arrive I am filled with a sense of wow. I’ve been to three games as an athlete, three as the team mentor/athlete service officer and these are my second as media. When rowing starts I will be working on CTV’s prime time show with Brian Williams as a studio analyst. It certainly is a bit of a dream to be working with Brian – he has told the story of some many incredible Olympic moments – including my own. I’d be lying if I said I wasn’t a bit worried about keeping up with him! Yesterday was a whirlwind of London tourist sites. I was with a group of my broadcast team mates and after getting settled into our desks and given our local cell phones we set out to orient ourselves – and frankly to start the process of beating jet lag. We watched the British Open over a long lunch in Canary Wharf, saw Big Ben, Canada House in Trafalgar Square, walked along The Stand to Leister Square, stopped at the Maple Leaf Pub in Covent Garden and then had dinner in Piccadilly Circus. Take that jet lag!! July 1 2012. Happy Canada Day! Soon you will go to London for YOUR Olympics. They will be different than anything you’ve ever done including World Championships, World Cups and other Olympic Games. How they effect – and affect you – is up to you. Everyone is different and being different is just fine. Today I’d like to share with you some advice from the experiences of two incredible competitors, Christine Nesbitt and Clara Hughes. A year ago, I asked World and Olympic Champion Christine Nesbitt to recount what it was like going to the Vancouver Olympics for her speed skating competitions. I had heard that the atmosphere and noise in the London Velodrome would be similar to that of the speedskating oval in Richmond and I wanted to pass on any tips to Tara Whitten, Zack Bell and our other track cyclists. Her message got back to me a bit late for their test event – but I believe the experience she recounted can surely resonate with you all.